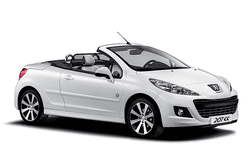 The Peugeot 207cc is an affordable drop-top, which means it'll always be popular. This also means you have to act now because reservations go quick and this amazing vehicle won’t be available for long! Boot space is reasonable, interior features are great, and you get all the power and safety that you would from a regular sized vehicle. Chic styling, excellent safety, power and control, spacious cabin, luxury feel, and much more are waiting for you with this popular model. You can enjoy advanced safety features and custom luxury options that make the ride even more enjoyable. Make your reservation for the Peugeot 207cc today while you still can!